Here’s a fun fact: This week marks the 10th anniversary of the print release of Agent to the Stars. 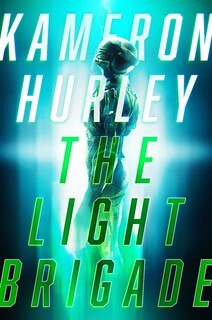 It was released in a limited edition hardcover from Subterranean Press, which makes it to date, and likely for the next decade at least, the only novel of mine released first by a publisher other than Tor Books (Tor later released it in trade, mass market and paperback editions, and Audible has in audiobook). Only 1,500 of these hardcovers (plus a few publisher copies) exist, making it the smallest and rarest of my first edition hardcover releases. I’ve seen it on rare book sites listed for over $1,000, although right at the moment on alibris you can get one for just $130. I have several. I’m saving them to pay for Athena’s college. Although the print edition of Agent is a decade old this week, the novel itself is rather older. In fact it’s the first novel I wrote — it’s my “practice novel,” the novel I wrote to see if I could write a novel (the answer: apparently!). I wrote it mostly on nights and weekends in 1997 in my apartment in Sterling, Virginia, on a desk shoved against the wall in our bedroom, using Microsoft Works, the company’s off-brand word processor. Before I started writing the novel, I was trying to decide whether to write a science fiction novel or a mystery/crime novel, as I enjoyed both genres equally; I ended up flipping a coin, and science fiction it was. If the coin landed in the other direction, I might have had both a vastly different writing career, and a very different life overall. At least some of you know that once I wrote Agent I made no real effort to sell it to publishers; as a “practice novel” the point was not to write something salable, but to write something that was novel-length, and then use that to see what things I did well, what things I should improve on, and what things I shouldn’t do. So when the novel was done, I showed it to Krissy (who was immensely relieved when she liked it — she was married to me, after all, it would be awkward if she thought I was a crap writer), my friends Regan and Steven and a couple of others, and then otherwise pretty much kept it in a drawer for a couple of years. Then in March of 1999, I decided, what the heck, I needed stuff on my Web site, and the novel wasn’t bad. So I put it up here as a “shareware novel” — people could read it and if they liked it, could send me a dollar in the mail. Over the next five years I ended up getting around $4,000 sent along, a not bad sum for a time when people had to actually make an effort to physically mail you money in an envelope (this also makes me an old school indie author, which is one reason my response to people who think there is some manifest division between “traditional authors” and “indie authors” is one of, well, amusement). It did well enough that when I wrote Old Man’s War, I didn’t think too hard about whether to post it up on the site, either. I did, and then it was found here by Patrick Nielsen Haden of Tor. He made an offer on it, and the rest is history. But note that Patrick didn’t make an offer on Agent, despite the fact that it was on the site, available and not bad, in Patrick’s estimation (he read it after he read OMW), and despite the fact that Tor offered me a two book deal when he bought OMW, the second book of which would become The Android’s Dream. When I ask Patrick why he didn’t want Agent, he said, in characteristic pragmatic bluntness, that it would be difficult to sell, in part because it was humorous and in part because it didn’t easily slot into a category for booksellers. It wasn’t military science fiction, it wasn’t space opera, it wasn’t “new weird,” which was a thing at the time, etc. I appreciated Patrick’s pragmatic bluntness — and I was getting a two book deal out of him anyway — so I didn’t worry about it. And besides, Agent was doing fine hanging out on the Web site. Fast forward a couple of years, to January 2005. Old Man’s War’s been published and is doing well, and I get an email from Bill Schafer, the publisher of a small press in Michigan called Subterranean Press. He’s read Agent to the Stars on the Web site and wants to know if it’s available to be bought. Well, I’ve never heard of Subterranean Press, so the first thing I do is check it out to see if it’s something more than a guy with a mimeograph machine (it was) and that this Schafer dude isn’t just some creep trying to take advantage of newer writers (he wasn’t). So I let Bill buy the book for a limited hardcover release. We asked Mike Krahulik of Penny Arcade to do the cover; I’d advertised Agent on Penny Arcade waaaaaaay back when, so he was a friend I could throw some money to, I liked his work a ton, and (because I wasn’t stupid) I was aware that as the first book cover Mike would ever do, the book would have collector value to fans of Penny Arcade even if they had no idea who I was. He said yes, turned in a really nice piece of art, and in July of 2005, the book — by that time almost sold out on pre-orders — went out into the world. It sold out entirely shortly thereafter. Here’s why, today, I’m happy the Agent was released then. First, because it started my relationship with Bill Schafer and with Subterranean Press, which is a relationship that continues to this day — SubPress publishes my limited editions and most of my shorter fiction. Bill and SubPress did well by me when I was just starting out, and I’m happy to keep working with them today. Relationships matter. Second, because Agent being published in print gave it an additional life: We sold it into foreign markets and to Tor for paperback (Patrick, again with his pragmatic bluntness, could buy it in 2008 because I had become a name, and readers would buy it because they already liked my stuff. I found this to be a delightful reason) and into audio. We get the occasional film/tv query about it, too, which is nice. Third, because it allowed me to not worry about “the sophomore slump” — that is, whether my second book would sell as well as the first or be appreciated as much, among the other bits of anxiety authors have about their second book. Agent was a small press limited edition, so I didn’t have to worry about whether it would sell as well or better; we already knew how many copies we were going to sell. It was going into a collector’s market where “quirky and humorous” was not a problem for sales. It was already written, so I didn’t have tie myself up in knots about it or freak out about deadlines. Basically, it was a really optimal “second novel” experience. Occasionally at signings, people will come up with a copy of Agent and confide that it’s their favorite novel of mine, as if that’s something weird, because OMW or Redshirts are the usual suspects for that title. But I like it when they tell me they like Agent. It’s my firstborn (if second-published), and it was written not because I wanted to sell, but because I wanted to learn. Writing it was a joy, if for no other reason than the dawning awareness I had writing it that, yes, in fact, I could do this thing, and I liked doing it, and that I wanted to do more of it if I could. That’s what Agent gave me that no other novel could, or will. It’s special to me. I’m glad when it’s special for other people too. So: Happy print anniversary, Agent to the Stars. And thanks, Bill and Subterranean Press, for publishing it. Here’s to more work together. Ha! I finished this book of yours just last week. I enjoyed it a lot. It’s hard to believe it`s a beginner’s novel. I very much enjoyed Agent to the Stars. It’s quirky and fun, and it’s an easy read. Perhaps its success means more humorous SF in the future from you? This was the second novel I read of yours, after Redshirts–and I think it is still my favorite. I believe you’ve improved as a writer, of course, but I just thought the central conceit was flexible enough to be both humorous and serious, and turned deftly from one into the other. Seeing the seeds of that vibe I get from most of your books (something humorous/with a light touch that could turn serious), is quite fun. I think this tendency led to probably my favorite character of yours, Hafte Sorvalh. We have the same problem in crime fiction with funny books being a hard sell. I know it’s back up, for the most part, with sales data but it boggles my mind that readers would rather be subjected to tragic stuff rather than funny stuff. I found your website through Jim C Hines, and being more a fantasy buff than a SF or MilSF fan, contented myself with reading your website, which I thoroughly enjoy. When Lock In came out, it sounded different enough that I took a chance on it and bought the ebook. Loved it. My husband, who is a fan of yours as well (although he’s more into SF than I am, and loves OMW), suggested Agent to the Stars as another book of yours that’s not too heavy SF that I might enjoy. He was right! I found it absolutely delightful. I’m currently working my way through The Android’s Dream. Really enjoying that too. It was a beginner’s novel, but it was also a beginner’s novel from someone who had been writing professionally for close to a decade at that point, and had been a humor columnist and also a film critic (the latter being useful because it is literally being paid to pay attention to story structure, pacing and dialogue, among other things). So a first novel, but not from a beginning writer. Which I suspect made a difference. I like Agent, but my favorite of yours (to date) is Lock In, partially because (a) I am a Master’s candidate in epidemiology, and (b) as a Tony Hillerman fan, I really like the Navajo connections. Interesting about OMW: it’s a fine book and I reread it. Nonetheless I consider a well-done but not imaginative take on a known trope. My fave so far is The Last Colony. My favorite plot point is Jared Dirac’s choice. Agent is my favorite because I like humor. I’ve enjoyed your other published works a great deal and rate them all highly, but Agent has a screwball element that only you and Connie Willis seem to mine in SF. It’s not that people would rather cry than laugh, it’s that humor is much more idiosyncratic, so there’s a greater chance to fail to hit someone’s sense of humor. Redshirts is a perfect example of that; it has the most negative reviews of any book I have because for people whose sense of humor is different than mine, it’s just not funny. This is one of your books I recommend to people who don’t know you and I like to call this the Scalzi gateway book for these readers. This book is just a fun read. Congrats on 10 years. I would like to advocate for a sequel. Good, now that that’s done, happy birthday, Agent to the Stars! I read the book first on the website, along with OMW, though I don’t remember which I read first. It was funny, and went in directions I didn’t quite expect, and I do find myself recommending it to people in need of a little light reading. But they can get their own copy…. Just FYI: I own a copy of the trade paperback of Agent to the Stars, but a few years ago, when I wanted to reread it, I downloaded a copy of the ebook from your website. Unfortunately, all the electronic versions I tried (two or three) were missing the italics. I don’t know if that’s been fixed since then, but if not, and it’s something that could be done easily, I’d love to have a readable electronic version. Also, I assume this is temporary, but I got a certificate error message when I clicked through from the RSS link on this post (I normally read Whatever via LiveJournal) to the actual website. I loved OMW: for the story and the story universe but also because I love it when writers are more than one trick ponies*. So on the strength of those two books I became one of those ‘I’ll go anywhere where he wants to go’ readers and have never been disappointed. *Nothing against one trick pony writers if they are good at it. There are various authors I follow as enthusiastically because they are incredibly good at what they do – and forget that damn pony: what the best of those writers do is a bit like Cézanne and that mountain of his, the one he painted again and again again. Same mountain but all different and delightful paintings. For those of you looking to get an ebook copy (I’m not sure if you still have it up on the website) Amazon has Agent of the Stars for $2.99 this month, along with The Human Division. I picked it up mostly because when I read it last year, it was my mom’s paperback and it was good enough for me to buy my own copy to reread. I have been a fairly long time blog reader, but stayed away from buying novels because I had a misconception of Old Man’s War being heavy MilSF which is just not my kink. Eventually I dipped my tentative toe into the Scalzi pool by using one of my Audible credits on Agent to the Stars, BECAUSE there was no hint of military theme. It was clever and entertaining and delightful, which was enough encouragement for me to trust you not to write a book that boiled down to 1000 ways to describe an explosion, and catapulted me into the rest of your catalog. I’m all caught up now, even on OMW. So Thanks! Lopsided heart for caretaker of lopsided cat. Vivat! This is one of the reasons I love reading Whatever. It’s not a blog about writing; it’s a blog about being a writer, about being one particular writer–but that writer happens to be an award-winning, best-selling author, so a lot of great information about writing and being a writer makes its way in. You’re one of my guideposts in the writing world, and I’ve recommended you to other writer friends as a resource. So, thanks for the window into your life and your work. My mom, who’s tastes run more to Jane Austen is listening to it and enjoying it. Although part of that may also be that she is a big Wil Wheaton fan. My extremely well read sister also enjoyed it, even though science fiction is not something she normally reads. She is now reading The Androids Dream and enjoying it. (She did wonder if you might be a little obsessed with Farting. A fair question considering the first two books she has read of yours). For my friends that might enjoy MilSF I give them a copy of Old Mans War. If not, Agent to the Stars is a perfect gateway novel to the world of science fiction. A might fine first novel, but as you say you had been a professional at this point for a while. Still enjoying everything you write. I first discovered your work at the library with OMW. Agent to the Stars was the first book I bought (the paperback version). My daughter also loved it — I think she was 12 when she read it. I’ve re-read it once and I laughed just as much as the first time. I too would love to see a sequel, or at least another book in that hard-to-nail down sub-genre, Humor-SF. On another note, I want to re-read the entire OMW series before reading TEoAT (which I pre-ordered from Subterranean). Since I don’t own the books (library check-outs) I need to get the entire set of the first 5 OMW universe. Is there such a set? No. There’s a boxed set of the first three books in mass market paperback, and the other two are available in the same trim. Where did you get the idea for your, let’s say, irregular format diversions? I.E. in Agents, near the end you give a montage of events through headlines. Lock In has Unlocked, an interview based prequel that shows how we got to the point in Lock In. The Sagan Diaries for the OMW series, and the 3 codas at the end of Redshirts. I like them and was wondering how they came about. Usually The Android’s Dream is my ‘get friends hooked on John Scalzi’ novel of choice (I think I’ve bought like ten copies over the years and my own paperback has been lent so many times it’s hardly ever on my shelves), but ‘Agent’ should probably be on that list too. I got the ebook from your site and really enjoyed it – maybe once my budget recovers from moving I’ll see if I can get a copy of the Tor edition from Borderlands. It’s a very enjoyable book. I think “Agent” was the one I read second, after “Redshirts”. I’m still catching up – haven’t read “Android’s Dream” yet because I got diverted by OMW et seq. I’ve recommended “Agent” to a number of people and would probably be going after that alibris copy right now if I weren’t on a very strict book budget (dammit). Well, I called myself the “Agent to the Stars”, and someone pointed me to your book due to the name. Got it, read it, loved it, and have been a fan of your work ever since. I should track down the first edition, love Mike’s work at PA too. I also think it’d make a great movie. Subterranean Press has also been very good to my friend Helen Patrice. Where else on earth would SF *poetry* get released (A Woman of Mars)?!? She almost passed out when they got Ray Bradbury to blurb it. Android’s Dream is my favorite. With Agent a close 2nd. Probably my nostalgic nature, 1st 2 novels of yours I read in that order. Yes, everything else is 3rd, still, preorder it all & can’t wait for next. A number of years ago, before I was familiar with your work (and this blog), while perusing the shelves at my local bookstore I picked up a copy of Agent to the Stars and read the back cover, etc. I purchased it specifically because it sounded humorous, so maybe Mr. Haden ought to consider that there is a demographic that enjoys humorous SF. And yes, I did enjoy the book, and soon after purchased more of your work. BTW love the photo of the fern. Is it yours? I re-listen to the audiobook every year or so (it’s a great performance by Wil Wheaton), congrats on another book’s 10 year anniversary. I love Agent to the Stars (in my top 3 with Lock In and Redshirts) and have also used it to introduce people to your work. I am due for a reread soon. Like next week. I just finished reading through it again last week. Still funny, charming, and witty. I remember when I first borrowed it from the library, it was in the cover shown above. When I finally bought my own copy, I saw the new cover and thought, “Something’s different.” It’s still got that retro look to it, but with a new pizzazz. One of those limited edition copies made it to my local library in small town Texas. I guess the acquisitions office there has good taste! I was confused when I saw later copies of the book without the Penny Arcade cover, but that was before I understood about Subterranean Press and limitedness. A fair number of libraries bought copies because it was well reviewed in Publishers Weekly and Library Journal, if memory serves. Congratulations, from one of those “signing confidants”. While I’ve liked all of your books that I’ve read (haven’t gotten to The God Engines or Lock In yet), Agent to the Stars is so far my favorite. It just really clicked with me. Huh – just re-read it two weeks ago, then my daughter asked me what it was, and she just finished reading it Monday. Now she’s on to Redshirts, while I just finished Androids Dream. Agent is one of my favorite books. I’ve liked everything you’ve written so far, but Agent and Android are my two go-to choices, with Fuzzy Nation a close third. Everything else is a close fourth; the race is pretty neck-and-neck, really. Wow, that long ago? I read it on your blog (surreptitiously at work because I didn’t have my own computer yet), and I sent you a dollar, too. Also got the SubPress hardback. I think I like it at least partly because it reads like something that was lots of fun to write, if that makes any sense. I really like “Agent to the Stars”. Read it somewhere online and a few years later got the paperback. I spent the early 90’s on the fringes of Hollywood and so it resonates with me the way OMW, etc. obviously can’t. I have to say Agent and the Android’s dream are my favorite of your novels, though I kinda feel that Thomas Stein, Harry Creek and Jack Holloway are the same person with different skill sets. A perfectly interesting person who can hold a fun book together but ultimately the same. 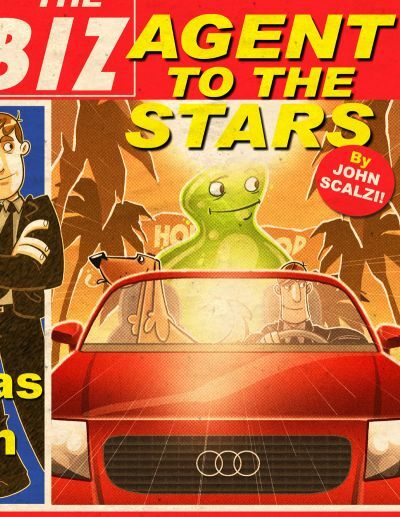 AGENT TO THE STARS was the first Scalzi book I read. I kept looking at OLD MAN’S WAR in the bookstore, since I liked the book design and found the blurb “A sci-fi essential” (or whatever) intriguing. But I’m not generally a MilSF guy, so I looked on Amazon to see what else this guy had written. AGENT TO THE STARS looked like fun so I ordered it. The Characteristic Pragmatic = my next band name. Bloody hell, I actually have a signed copy of this that I got at a used book store ages ago. I had no idea it was so rare! This is exciting. One more member of the “AGENT was my intro to Scalzi and remains my favorite” club. We should have jackets made. Maybe it’s because I stumbled upon it online, and I still retain the delight of discovery; I own the paperback now, but still prefer reading it on my phone, on the subway, as I did the first time. Maybe it’s because I work in Hollywood, and you got so many details hilariously right. Maybe it’s because it led me to all of your other work (including Whatever), from which I’ve received so much enjoyment. But I think it’s mainly because the joy you found in creating it, in learning you could do this and do it well, lives in every line. It’s a gem, and I’m happy for an excuse to thank you for it yet again. Also, I agree with Shane: I’d like to see a sequel to Agent. I’m ready to buy it! Ugh. Well, I *will* be ready to buy it when it’s written. I think you had a post previously where we could list the order of our favorite books. Agent to the Stars is one of my favorites and I recommend it to my friends as a first read. I also love Fuzzy Nation and Android’s Dream. I read the OMW series first. I liked the series a lot but Zoe’s Tale just knocked my socks off. I never realized you were a teen girl at heart. You captured the spirit completely. I wonder if mystery novelist get along better than SF novelists. I dont read many mystery novels or visit their blogs. Just wondering…. How do you get a blog like this going? It had to bemore than just your friends. John said he was active on the usenets. Did word of mouth spread through that? A friend directing me to read that story is how I started reading your blog. One of the first blogs I started reading, too, since I had just moved to a place with actual internet access and my own computer for the first time. I’ve never read Agent to the Stars, but that Penny Arcade cover is why I’ve read most of your fiction. Essentially, it got your name in my head, and when someone else (probably on Elizabeth Bear’s live journal) was talking about Old Man’s War, that previous mental connection got me to pick it up. It’s not my favorite of your books because it’s got some “First Book Problems” (that lump of flashback about a third of the way in, for one), but it’s still a lot of fun to read, and shows you’ve got a real gift for humorous storytelling which you paid off brilliantly with Redshirts. If you hadn’t gotten Old Man’s War published first, it’s likely you’d be better known for Comic SF than for Military SF. So, like, is the car on the cover three-quarters of an Audi? PS) Android’s Dream is next in my queue. 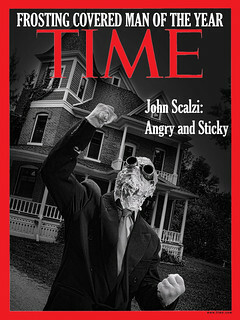 I hope I don’t over-Scalzi! Lol. Agent to the Stars is among my favorite SF; it’s well written and carefully put together and very funny. Like others, I’m surprised that no-ones optioned it for a film script – when I first read it I thought it might have in fact have developed from a draft script. I love Agent to the Stars! It was the first book of yours I read, as I started to read your column first — oops, that was old-school, your website, and my husband had a number of your books on hand. I laughed out loud over and over. I still think it’s my favorite, even though I have now read everything else you’ve written. I love funny books, what can I say? First laugh out loud moment for me. Any word on if a re-print is in the cards? I’ve love to see it again in hardcover with an updated cover from Mike and maybe a foreward from Jerry? Man that’ll appeal to like 7 kinds of nerd in me. Very unlikely at this point. Having just finished Cline’s Armada a few days ago, Agent’s got some interesting relevance. As several people have noted, I’m surprised Hollywood hasn’t found the book and made a version of it. But that asexual reproduction & mental intimacy stuff probably confused them too much. As I commented on Twitter recently, this is still probably my favorite book of yours, and I do feel kind of sheepish about that for some reason. I *think* it’s also the first book of yours that I read. – It contains a classic Heinlein Romance, for which I have always been a sucker. Also, I have one of the limited edition books. It’s always been something of a prize possession, but I didn’t realize how sought-after they’d become. Neat! Anyway, congrats on the anniversary! I read almost all my Scalzi through the library but then started purchasing so I could hand books out to my friends. ‘Agent’ is my most recent acquisition but has been sitting patiently on my bedside shelf under a torrent of Hugo reading.